Spending time in art museums always refills my soul in ways I struggle to verbalize. Seeing paint on canvas, the aging of marble, the intricate woodwork of gilded frames; it all feels somehow, though often centuries old, like a breath of fresh air. Details of Pieter Bruegel’s Massacre of the Innocents. When I was making these I realized all the fantastic things I miss when I just see it. The way the horse’s tail is tied in a bow, the way that Bruegel frames the bodies of animals and men alike. The lack of outright blood and gore, but still omnipresent violence and the threat of it everywhere, hemmed in with the most lovely, peaceful looking rooftops and skyline. The sky alone could be looked at for quite some time, in my opinion. The delicate hues of pink, the richness of his browns, the touches of blue, the harshness of the green against the winter village setting, even the cold glint of armor- a wonderful whirlwind. I find them simple but not wanting for anything. They are entirely whole- there is nothing missing, nothing I want more of. Except for her to do more animals and monsters, as a lot of her illustrations are of people! For some reason how she interprets non-human forms just delights me. All images hyperlinked to her gallery, go check it out! I am an atheist, but I’ll be damned if religious imagery doesn’t get me every time. You can’t not sigh in front of Giotto or be mesmerized by Grunewald (which I will do a post on soon, he’s so fantastical) or just sort of wonder how Michelangelo did what he did (research suggests he had autism or Asbergers, which may have affected the way that he created how he did). 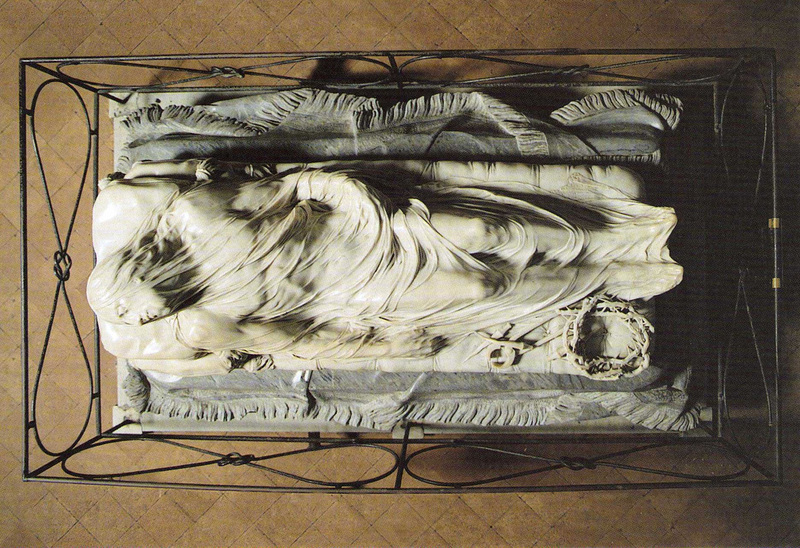 I didin’t know that Italian sculptor Giuseppe Sanmartino existed until recently. 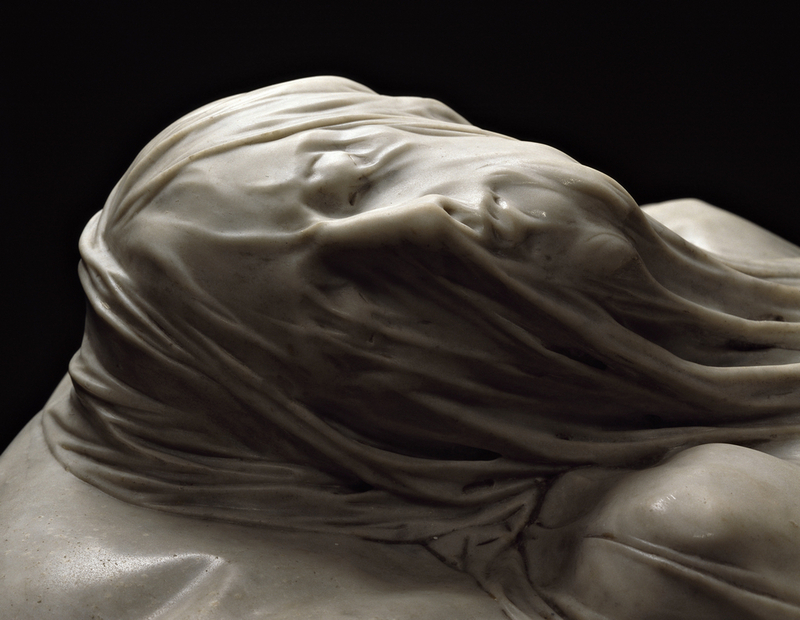 I saw Cristo Velato (Veiled Christ) and immediately wanted to know more. There fact that this guy was able to make this out of MARBLE?! Blows my mind up to where space and earth combine. I can’t handle thinking about how he created such a masterpiece. The crown of thorns at Christ’s feet, the nails used to keep Him on the Cross- there is an emotional connection here that even those of us who don’t believe in anything “after” that means something. This is High Baroque marble sculpture, so no doubt Sanmartino was influenced by people like Bernini, but he holds his own in making us really believe that the marble is cloth. I love it when an artist has clearly staked out a niche, and then makes it entirely their own. The works of Pieter Bruegel the Elder are fantastic in this way- he has a formula, and he has made it near perfection, but flexible enough that he can warp the typical scene- a landscape with many figures and lots of action and perspective- into whatever surreal experience he wants us to feel. He was a “Flemish Renaissance” artist. What that means is that he lived somewhere in the Southern Netherlands or Northern Belgium and spoke a dialect of Dutch particular to the area. Flanders was a big trading city and usually occupied by the Spanish or other invaders. This meant, however, that it was possible for many artists and forms of art to trickle in because of the outside influences as well as a result of their trading status. Regardless, Bruegel is a badass. I love his scenes- they’re like Hieronymous Bosch with their creepy vibes trickling into our blood and sort of making us wonder what was going on in his mind. I love his attention to detail, and while it can be exhausting going through his paintings it’s because everything is vibrant and pulsating with energy. Even the peasants painted far off ice-skating on a winter day make you want to be there. There’s something so terrifying and gorgeous about Klimt’s work. All of it has these seeping tones of sensuality, but The Kiss is still an ultimate favorite. People all over the world know this painting, and it is one of the most popular images from art history anywhere. What I love about it is the uncertainty of what’s going on. Is he kissing her, about to push her off the precipice her feet so delicately grip? Is he saving her, comforting her, or forcing her into this embrace? What happens to the characters Klimt paints is really up to the viewer. Right now, as it goes in my life, the precipice is the future. It’s the next step, and these gorgeously painted creatures know no more about it than I do. Edvard Munch doesn’t really circumvent anything. He goes right for what he’s feeling- betrayal, heartbreak, being misunderstood, isolation, narcissism. His art speaks volumes and it’s full of mysticism and outright feeling. The Kiss has been one of my favorite works of his for a very long time- it’s right up there with his The Dance of Life. There’s something so brooding about Munch’s work that I relate to. The simplicity of what he’s feeling is so obvious, but there are also many layers one can look for in this blatent display of emotions. What was the catalyst? What are the consequences? What are the implications of looking at this work this way? The Kiss can be interpreted in many different ways to me. It shows how a kiss can momentarily combine two anatomies into one, or it can show, if you want to be dark, how emotions and expressions of such can feel imprisoning and claustrophobic- this kiss has implications beyond just the shared embrace. The Kiss can also be looked at in the two ways Munch showed it- a moment of being bare to the person you are kissing, or a moment of modesty and false promises. A clothed person could be hiding more. In this way, Munch’s obvious emotions really just create more questions than answers. I love his works more than words could ever try and express. Bryan Pearce: The most amazing artist you’ve probably never heard of. One of my Art History professors in Switzerland, Dr. Brian Stanford, taught a class on how art and the brain work together. We studied people who end up with unorthodox circumstances and how their art is different from classical ideas of “art” and accomplished art. Bryan Pearce, a Cornwall native, was born with Phenylketonuria, which resulted in his brain not developing normally. As a result, his art has amazing perspectives, use of color, and the most naive, gorgeous landscapes I’ve ever seen. I haven’t been lucky enough to personally see his work (I didn’t make it to the Tate when I was in London) but emotionally it is somewhat unsettling in a wonderful way. What’s amazing about Mr. Pearce is that he began exhibiting regularly and remained an artist his entire life. He was England’s most famous naive artist, and with his disease he lived to the age of 77– something almost unheard of! Luckily, because he started working and exhibiting in his 30’s, there are many prints and paintings of his that exist (prolific artists are the best- they have so much to show). Yesterday at Sotheby’s, Edvard Munch’s pastel on board “The Scream” sold for a whopping $119,900,00.00 dollars, to an anonymous phone bidder. At the most expensive art work ever sold at auction, what does this mean? Why is “The Scream” worth so much? I know that many (superior) websites and blogs have already written about this, but as a vehement fan of everything Edvard Munch, “The Scream” especially draws my attention. 1. It’s the last copy of “The Scream” available ! There are four editions of Munch’s “Scream”- three are in Norweigan museums. Rumors that a family in Qatar purchased the final pastel and board “Scream” are of course, just rumors, but it means that possibly the final “Scream” will be available to those outside Norway. (Unless the anonymous phone bidder was another Norwegian!) Basically, once this “Scream” is gone, there won’t be another coming up for bid unless the Norwegian museums become extraordinarily strapped for cash, which I doubt will occur. 2. This piece is iconic. This doesn’t really need to be said, but it needs to be emphasized. “The Scream” ranks up with Da Vinci’s “The Mona Lisa” as far as pop culture influence goes. Everybody knows it. Too bad that Munch didn’t live to see his piece become so wonderful. Munch himself was a depressed man who died alone just before Norway was liberated in World War II. His life is punctuated by death, tragedy, and general melancholy. It’s a rare masterpiece by a fantastic Expressionist artist, something to be treasured more for it’s breakthrough technique and feeling rather than just for it’s popularity in our culture. 3. The name says it all. Artists are a brandthese days. “I own a Matisse still life”, or “Yes, well this is a rare Goya that we have here!” are things that people like saying. Paintings by well known artists, especially good paintings, are harder and harder to come by, as they’ve been mostly snatched up by museums or private collectors. The opportunity to own a Rothko, a Picasso, or even a Munch is not one to be missed. Most of the masterpieces, from the Renaissance onward, are gone, and with them the chance to own a priceless piece of art. Every chance that is there must be seized, so to say. 4. Art is an investment (and a status symbol). Since the 1990’s, art has been a solid investment of capital. Art prices have not been dipping, and while sometimes at the annual auctions with Christie’s and Sotheby’s the estimates end up being more than the final bid, art has been a winner for a solid 20+ years now. If you have the money, and you want the prestige, art is a perfect place to go. Corporations these days are even beginning to invest in art- notably Deutsche Bank, which has amassed an impressive collection and even gives tours of it’s collection. 5. Money doesn’t really seem to matter to some. If you can pay $120 million for a piece of art, what can’t you buy? The art market in the last 20 years has underlined the fabulously wealthy and their want for some legitimacy in the world. Russia’s explosion into the art market, Middle Eastern money, and South American and Asian dealers and elite are all vying for the few pieces that are worth buying, because the price is worth the class that comes with it. If you own eight homes, drive whatever car you fancy, and money is no object, picking up a fabulous piece at an auction seems almost compulsory. 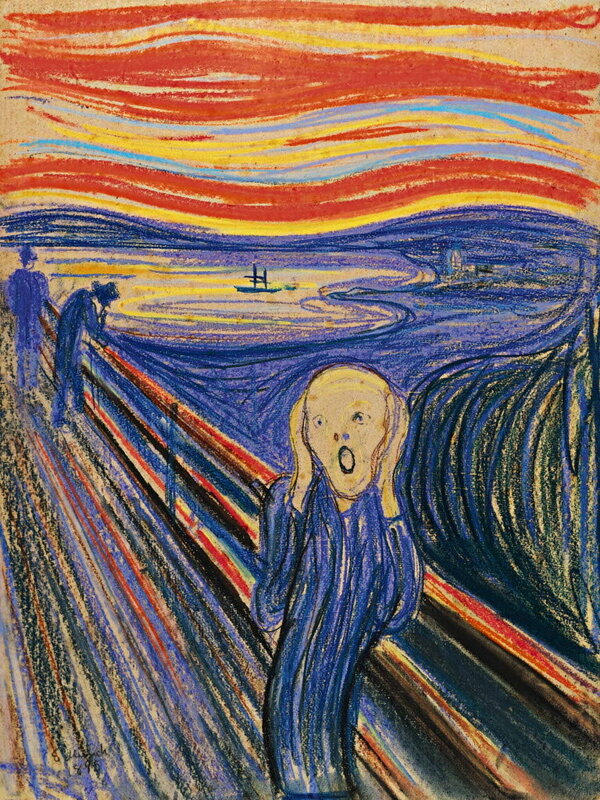 My take on the auction: Money doesn’t matter, clearly, but I hope that whoever purchased “The Scream” makes it available to the public for at least a little while before it becomes cloistered in a private collection. If the bidder were to even let it tour a few major museums first, well, that would be most excellent! I feel that the significance of “The Scream” was missed a bit, that perhaps sensationalism and rarity drove the price upward rather than the sheer talent that Munch possessed. “The Scream” was first created in 1892- an incredibly early date for such a modern, non-representational piece. It’s pure Expressionism, and much more abstract for it’s time than anything produced in the 19th century. Decades ahead, Munch’s “The Scream” has given the art world a look into his brilliant, tormented mind. I really hope that the significance of the piece isn’t lost on the bidder. Writing a paper, studying for an exam, listening to Eurotrash, consuming Red Bull. I leave you with a detail from The Descent from the Cross, by Flemish artist Rogier van der Weyden. This piece is in the Museo del Prado in Madrid- seeing it at the time I didn’t understand how gorgeous this painting is. Even though I’m an atheist, I can appreciate the emotion, and the haptic feelings here in this piece. Also, look at that blue! Egads! For being painted in 1435, this work sure blows my mind. Ciao, I’m off to write about Miriam Schapiro and feminist art! Any chance to be close to art is a chance I’ll take. I’m an Art History major who loves art to the point that I have cried in front of a painting. Yup. The rest of the museum was super quiet as a result, which was fantastic for me! I was able to take lots of pictures from weird angles and not get judged- I tend to take pictures from the floor, or sit on benches and balance the camera on my head because my hands aren’t stable enough. My favorite part is the old Italian wing, where they have lots of Byzantine paintings with amazing gold gilding, mostly on wood. The Baroque room is ostentatious and ridiculous, but nonetheless entertaining. The museum has a really great collection of objects and is laid out in a really great way so that you don’t feel crowded by other people or feel like you’ve seen the art before- I always go back and find something new every time I visit.